If watching people biting off each other's toenails amuses you, then Bio-Dome will be a welcome gift. For everyone else residing in the semi-civilized world, ask yourself why Salman Rushdie must remain in hiding while Pauly Shore walks freely among us. So many things stink about Bio-Dome, it's difficult to decide where to begin. Let's start with the premise: wacky slackers Bud and Doyle (Shore, Stephen Baldwin) get locked into a Biosphere-like experiment for a year. 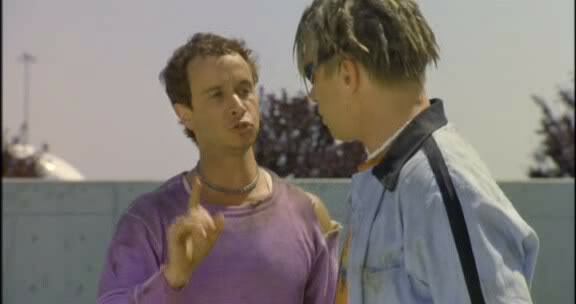 Now, how many people eager to see a Pauly Shore film in the first place do you think will even get where the idea came from? Then again, given what passes for humor in these outings, it's obvious that plot isn't a high priority. Unfortunately, plot does seem important to the five individuals credited with the story and screenplay for this cinematic cataclysm and they stretch it out. The Bio-Dome founders plan for the experiment to take a year and the movie seems just about that long. In addition to the leads' annoying performances, lackluster work comes from William Atherton, who looks bored silly playing the villain, and inexplicable cameos from Patty Hearst, Roger Clinton and former Oklahoma TV broadcasters Ben and Butch McCain. The McCain Brothers in their small roles play — in a real stretch — broadcasting brothers with Ben anchoring and Butch reporting. They don't seem any more realistic in the film than they did when they served those functions on local TV news. The film actually does have positive attributes, namely scenes in which Shore doesn't appear and a throwaway gag that actually made me chuckle in spite of myself set to "The Safety Dance" by Men Without Hats. Aside from that, Bio-Dome earns a place as one of my all-time most excruciating film experiences.